Jamaica / September 6, 2009. I just returned from the seventh annual Irie Jamboree Reggae Festival in the Jamaica section of Queens and I have only one regret … that I was working it. The musical talent was superb, the food played well in its supporting role, and the crowd was cool ... mon. 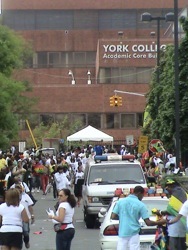 I arrived after 3 pm on the campus of York College, which played host to the concert. York College was far easier to get to than Roy Wilkins Park which was the venue last year, but unlike the park, most of the outdoor space was blacktop instead of a grassy field. That said, it seems the fans easily adapted to the change. 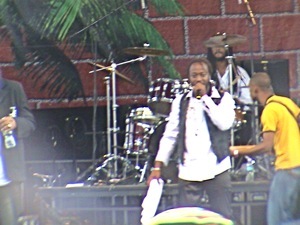 Thousands of people attended the all day concert, which attracts a largely African American crowd. But this year I noticed an influx of other ethnicities, which I attribute to the word spreading about what a great music festival this is. After passing through the entrance gates, I browsed through the souvenir tents and through the food booths. Eventually I made my way down into the main concert area where they had installed this huge rockfest stage so that everyone could see the musicians from nearly anywhere within the gates, save the entrance corridor. A DJ, Rally Bop, was finishing his gig as I came down into the concert area. I met him on a break in the press area where I photographed him with some of his entourage [see photo to right and Rally Bop is on the left]. As I stood within the crowd, several boom cameras hovered above the crowd videographing both the performers and the crowd while simulcasting the images onto the two large screens facing the crowd on either side of the main stage. Onto the stage came Anthony Cruz singing Block Di Road in traditional syncopated reggae rhythm. 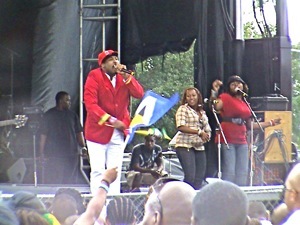 He followed with some rhythmic love songs and started the crowd on its journey into Irie Jam 2009. It was nice melodic kick off into the reggae rhythms. Here we were, relaxing on a warm dry breezy Sunday afternoon in Jamaica, listening to some of the top Reggae musicians in the country. And the food, which we’ll get to a short bit later, was also good. The music and the vibe seemed to permeate me this year in a way it hadn’t last year. The stage and the musicians seemed more accessible and hence connected to the crowd. The crowd seemed more relaxed as I meandered amongst them shooting photos for this story. Flourgon followed Cruz. Fourgon has a classic Jamaican accent and a strong rich clear voice. The lyrics of his tunes include a mix of anecdotes, refrains and themes. And in the background the mellow sounds of the drummer, the keyboards and guitar. The crowd began to sway to the music, enjoying the beauty of the day. Lady G came out on stage next. 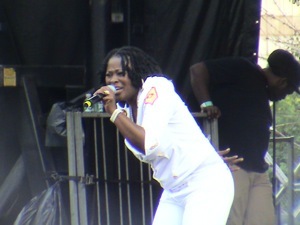 She was the first female reggae artist of the day and she eased right in and upped the mood a notch. Her Jamaican accent came ringing out as she regaled us with her calypso rhythms and lyrics of social injustice. It seemed the Caribbean had arrived in Queens this afternoon ... right here in Jamaica … Jamaica Queens. 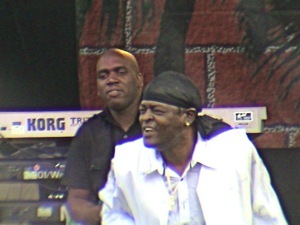 Sugar Minott was up next. He's one of the originals. 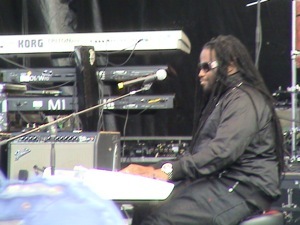 One of his melodic tunes reminded me a bit of Stevie Wonder but what he performed was all reggae. Like Stevie he has a soothing sound and some of his music seems a blend or fusion, but then all reggae music really is. I headed off to the press area to check out that scene. 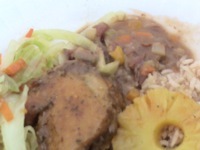 I followed my nose to the food tent where I was served a dinner plate by Schins Restaurant which is located along Merrick Road in Laurelton in Queens. I shot a photo of the food so you can see for yourself, but let me give you a brief description. The cabbage was cooked al dente, the rice and beans definitely hit this hungry man’s spot, the chicken was lightly seasoned with a honey like sweet oil which permeated it like a marinade and moistened it, and the bean flavored sauce added a nice gentle peppered flavor to it. MMMmmm. I headed back out into the main concert area. Gramps Morgan came out onto the stage. Gramps has an almost country accent to some of his work. But then reggae seems to be an open musical genre – a blended mix of blues, jazz, rock and roll, spiced with a west Indian accent. 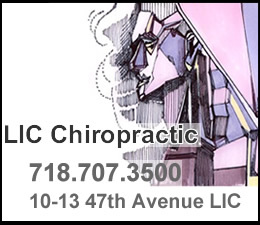 Kind of like Queens – open, mixed and constantly changing. The sun was setting in the west and my deadline was nearing so I began to make my exit. Spice was due out later in the evening. When I returned home I caught some of the later acts on the Irie Jamboree website where they did a nice video simulcast. My thanks to Irie Jamboree and Schins Restaurant for their hospitality. And my compliments to all the great Reggae musicians whose performances I had the pleasure to enjoy. See you next year. 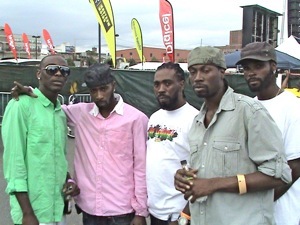 Click here to view the photo album of the Irie Jamboree 2009. Scroll down to use a box which allows you to send this story to a friend. Click here for a map to the Irie Jamboree 2009 at York College. Click here to view the Irie Jamboree website. Click this link to go to the Jamaica Neighborhood News / Jamaica Restaurants Guide & Map / Jamaica Business Directory / Jamaica Shopping Center and Map.